Can science tell us how much ethical responsibility different countries bear for combating climate change? It's going to try. According to a draft of a forthcoming Intergovernmental Panel on Climate Change (IPCC) report, ethics takes a front-and-center role in a forum traditionally reserved for exploring scientific consensus. The real-world implications of those ethical questions of responsibility will play out over the next several months of U.N. climate treaty talks, making ethics -- along with a chapter on the costs of mitigating emissions -- among the report's most controversial topics, sources said. The United States and several other countries have sent members of their climate negotiating teams to Berlin, where governments this week are wrangling line-by-line over the final wording of a 29-page document that highlights thousands of pages of findings. 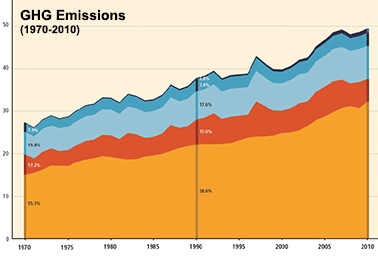 The new Intergovernmental Panel on Climate Change report shows categories of greenhouse gas emissions and how they grew in the atmosphere between 1970 and 2010. The categories are emissions that stem from fossil fuel combustion and industrial processes (yellow), CO2 from forestry and other land uses (orange), methane (light blue), nitrous oxide (blue) and fluorinated gases (dark blue), some of which are used as refrigerants. Graph courtesy of the IPCC. "Governments are just so wary about the implications of the IPCC for the negotiations. Anything that is touching on burden-sharing ... I think will be just impossible to get into the summary for policymakers," said one person close to the discussions. Indeed, an early version of the summary obtained by ClimateWire plays it safe, noting merely that international cooperation on climate change "involves ethical considerations, including equitable effort-sharing." Countries, it notes, have contributed in different ways to the accumulation of greenhouse gases in the atmosphere and differ in their abilities to mitigate emissions. "Evidence suggests that perceived fairness can influence the level of cooperation among individuals, and that finding may suggest that processes and outcomes seen as fair will lead to more international cooperation as well," the summary says. Authors involved in the ethics chapters, who agreed only to talk generally about efforts to examine and synthesize the research until the IPCC report is formally released Sunday, said the charged questions of what constitutes dangerous man-made interference of the climate system and what countries should bear the burden of mitigation are ones the IPCC has taken on in the past. But unlike other areas the United Nations' climate science body has taken on, like sea-level rise or glacier melt, these are questions that can't be measured or modeled with scientific accuracy. Rather, much of the research that has been done on the ethics of burden sharing rests on a set of principles that are essentially a matter of moral opinion about how, ideally, the world should work. "We are trying to look at the social, economic and ethical conceptions of [things like] what is 'dangerous'? It's a matter of natural sciences ... but it also is making a value judgment about what we as humans consider dangerous," said Kevin Urama, executive director of the Africa Technology Policy Studies Network in Kenya and a co-lead coordinating author of the ethics chapter. "The ethics deals a lot with justice, fairness, distributional weights. Basically, it sets a pace for better understanding for policymakers," Urama said. "Really, what we're dealing with climate change or historic responsibility is 'What do we think is the ethical way to view someone who did something harmful, but before anyone realized it was harmful?'" said Charles Kolstad, a Stanford Institute for Economic Policy Research economist and co-lead coordinating author of the chapter. Some of those questions are in fact answered in common law, Kolstad noted. Still, though, he said that while the IPCC lays out ethical theories that policymakers can use, the authors don't make conclusions. "Some people thought if we put an ethics chapter in there, that would answer the question definitively. That was wishful thinking," Kolstad said. "We indicate that you can't find a definitive answer to this question of burden sharing by looking at the research. It has to be negotiated." That's a given. Wealthy countries like the United States already have been making a play to just avoid the entire question of a nation's "fair share" of emissions cuts by having countries volunteer to do what they can and impose a type of peer review process in which other countries or actors can assess the others' efforts. China and other developing nations, meanwhile, have called on countries to justify their pledges by describing how they take equity into account. "The questions around equity can't be avoided if we want to have an ambitious agreement," said David Waskow, director of the World Resources Institute's International Climate Initiative. "If you completely avoid those questions, you're stuck with a pretty global requirement that doesn't in fact figure out how the actions can be taken at the end of the day." In another part of the report that is also drawing some concern, the IPCC summary estimates with high confidence that ratcheting down emissions to keep the carbon dioxide concentration in the atmosphere below 480 parts per million by the end of the century will result in global consumption losses of 1 to 4 percent in 2030. That will jump to 2 to 12 percent in 2100 compared to what would happen without mitigation, the report notes without attaching a dollar figure to the estimate. "These costs do not consider the benefits of mitigation, including the reduction in climate impacts," the summary notes. Meanwhile, the IPCC also veers away from scientific research and into legal, economic and political science scholarship in the first-ever chapter on international cooperation. It remains to be seen whether the summary for policymakers' judgment on the 1997 Kyoto Protocol will remain in the final version. They cited, with medium confidence, that the first binding step toward implementing U.N. climate goals "has not been as successful as intended."